Two quick-thinking deputies dragged a man out of his car just moments before two trains plowed into it in California. 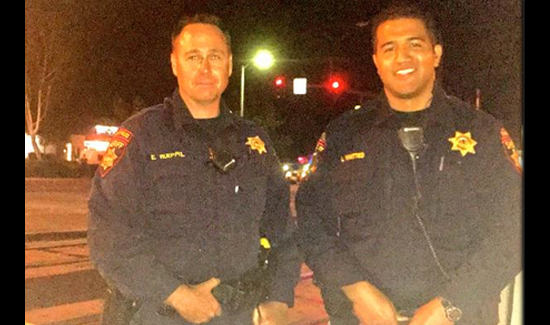 San Mateo County sheriff’s deputies Lance Whitted and Erik Rueppel were just blocks away when they heard a car crash into a crossing guard Monday, sheriff’s spokesman Salvador Zuno told reporters. They ran to the South Mary Avenue intersection in Sunnyvale and found the car trapped under the gate — just as a train was approaching about 6:40 p.m.
As you can see in the video above, one officer raced to the car and yanked out the driver, a man in his 20s. After running several feet, the man fell to the ground, forcing the officer to drag him by the arm to safety. Meanwhile, the other officer went to the tracks to signal the train to stop. Seconds later, the Caltrain No. 385 barreled through, smashing the hood of the car into pieces.